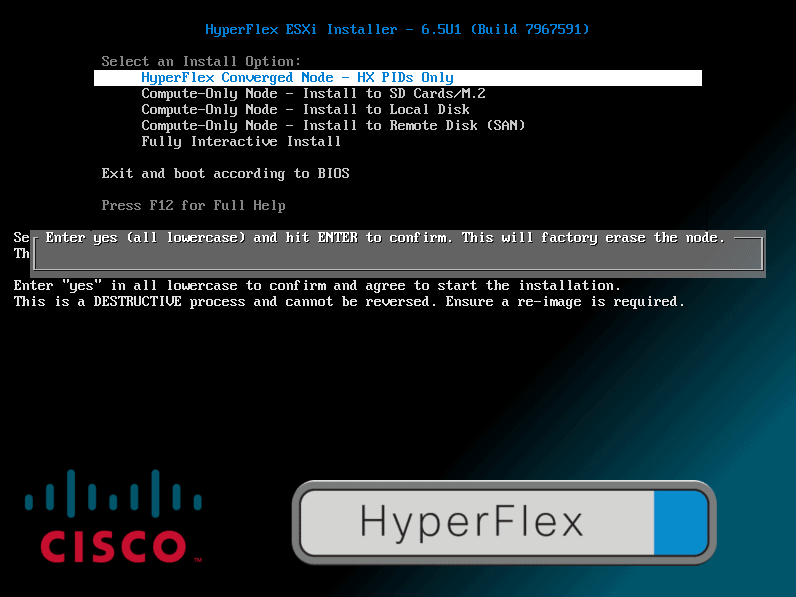 HomeTechnicalData CenterRe-Installation of HyperFlex. The Unsupported Way ! In my lab I do a lot of testing, demo’s which includes also an installation of a HyperFlex cluster. 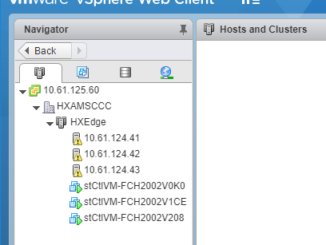 If you just do a re-installation of a HyperFlex cluster, you can get all kind of errors because there is still a lot of information saved on the Storage Controller and on the ESXi partition. 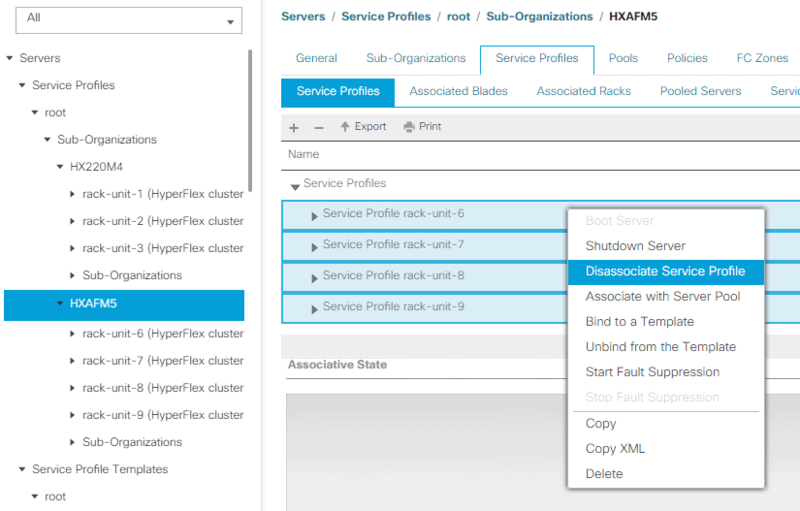 There are some official documents on how to re-install a HyperFlex cluster again, but that takes me too much time and I couldn’t automate it. You should do some things at the vCenter server, in the CLI of the HyperFlex cluster and then the installation. I am lazy and I don’t want to do a lot of thing myself over and over again, so I created my own way of a re-installation. This method is NOT supported by me or Cisco. 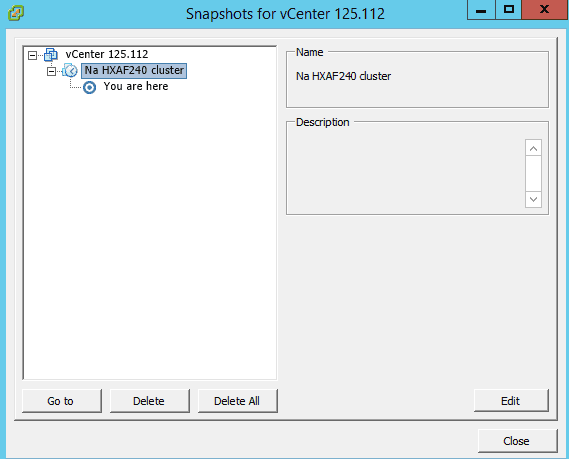 The easiest way to bring vCenter back to an original state, is to use a snapshot. For my demo I am using a vCenter server which I bring to the original state before a new installation. This way I don’t have to change the mod’s, remove the DS, Hosts etc etc. This was easy ! Wasn’t it. Now we’re going to the UCS manager. 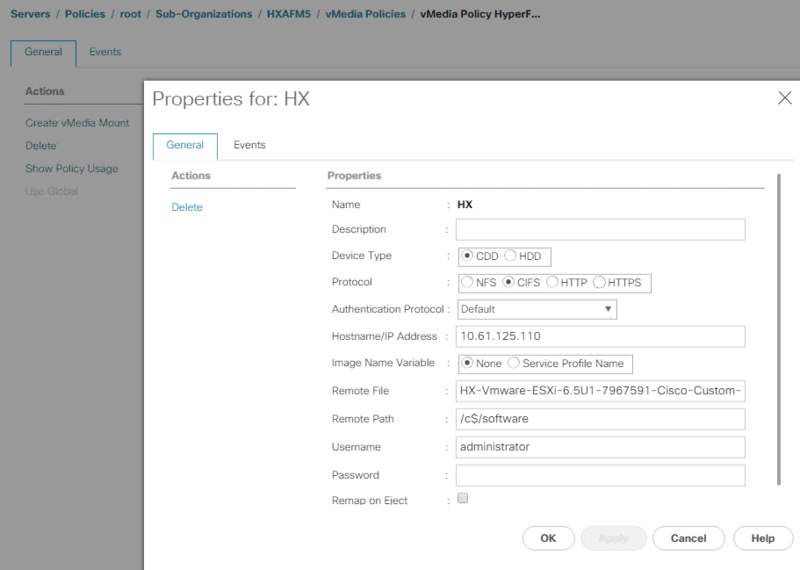 The HX servers already got a service profile. 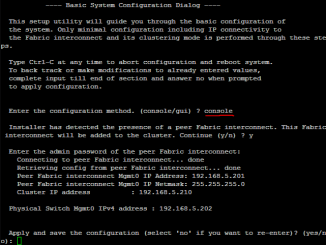 I am having multiple clusters under the Fabric Interconnects, so be sure you pick the right Sub-Organization. First change the right Boot Policy. 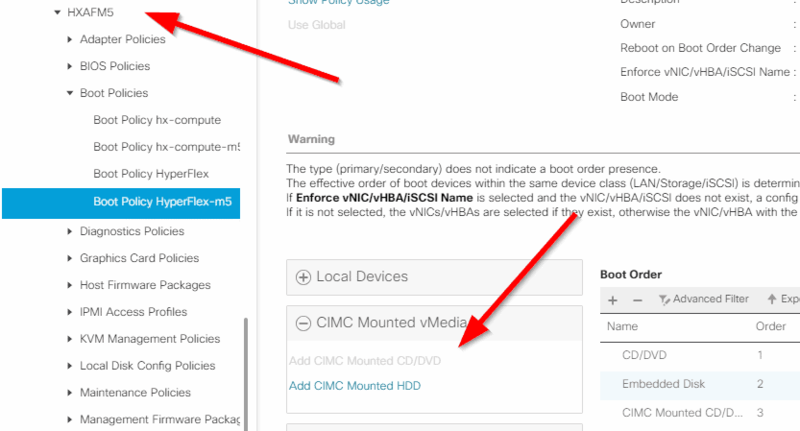 In this case I got some M5 server, so I am changing the HyperFlex-m5 boot policy. You will have to add the CIMC Mounted CD/DVD. This is that we can boot from the vMedia we’re going to configure later. 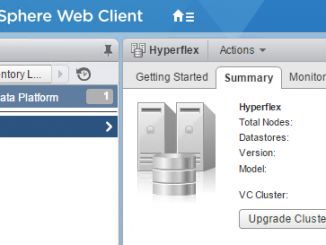 We make sure that the HyperFlex Scrub policy is changed to that the Disk AND FlexFlash are scrubbed. In this case there is nothing left on the drives when we disassociate the service profile. Now we configure the vMedia policy. When this is configured, we can disassociate the server from the profile. This can be done for each server. But you can do it also for every server in one time. Just select all service profiles and disassociate. Now the servers will scrub the disks and you will have to wait for a few minutes until the servers are in a disassociation state. After that you can assign servers again to the service profiles and the servers will boot with the ISO. I don’t want that, because I will have to setup a KVM connection to each server and that takes time. This menu is part of SYSLINUX. When you change the ISOLINUX.CFG, just add timeout 30 to it and a MENU DEFAULT. In my case I delete the rest of the menu’s and make sure that there is no PASSWD in the config anymore. The ISO will now boot without any interaction. This makes my life so easier ! It’s a quick and dirty method, but for me it’s working ! 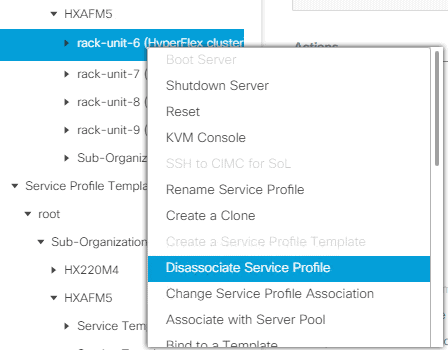 Select this option to re-image HyperFlex converged nodes (HX PIDs only). This option SHOULD NOT be used for upgrades, see help section for details. Enter "yes" in all lowercase to confirm and agree to start the installation. This is a DESTRUCTIVE process and cannot be reversed. Ensure a re-image is required. Have you deploy HX240 M5 Allflash or Hybrid ? Which HX installer and UCS firmware version you used ? 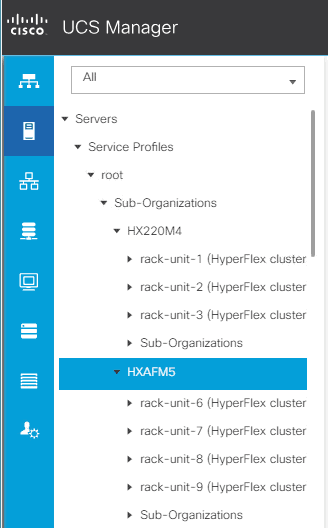 You can see at the Cisco site a matrix with the right firmwares, or have a look at the HyperFlex 3.0 release notes.